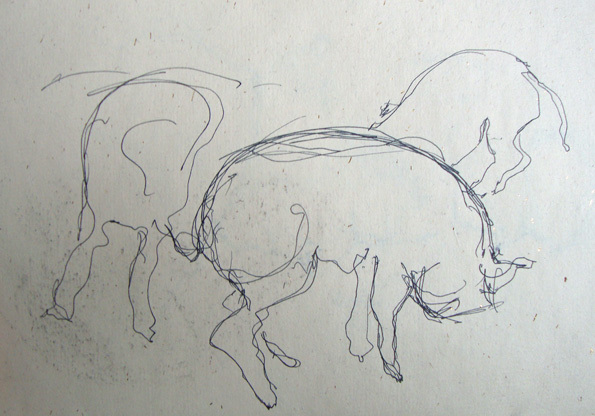 Husb and I spent a happy few hours with Illtud and Liesel at their farm in Pontyates and I took the opportunity of sketching their pigs. Illtud also writes an excellent blog about being an artisan charcutier, but vegetarians might find it a bit much. 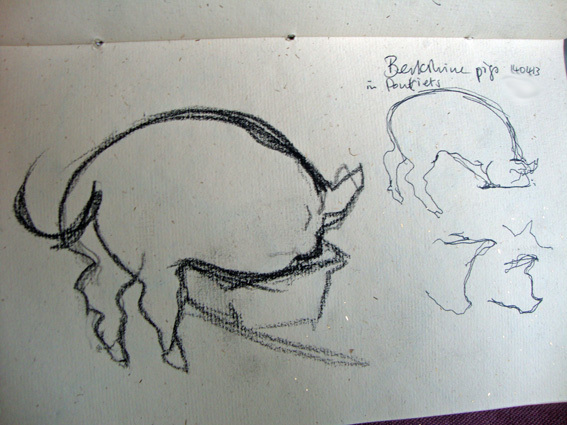 I started off by sketching some of the little pedigree Berkshire piggahs during feeding time. They’re about 4 months old and they were not at all interested in the furless monkeys gawping at them and kept their noses firmly in their trough. It was weird drawing an animal I’m not used to. Mostly I draw people and cats and it took a while to get used to a new physiology. I tried scribbling with a Pentel V5 pen and also with black and white conte crayon. 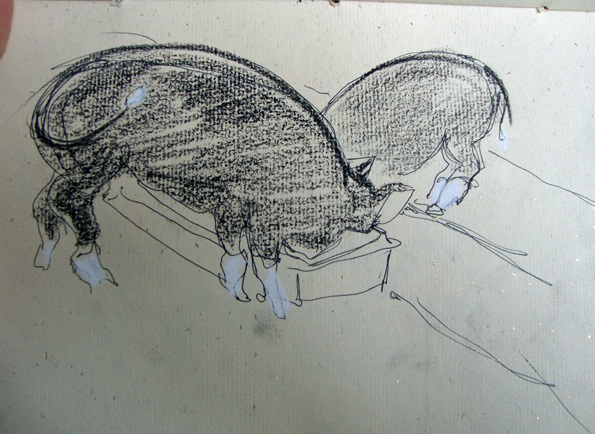 They’re short-haired piggahs, mostly black with darling little white socks and white splashes on their faces. They are remarkably dainty and walk around almost on tiptoe, like teeny piggah ballerinas. Some of these might be reworked as drypoint etchings in the near future. Oh they will be. We buy all our pork products from here and it’s the best charcuterie I’ve ever tasted. Yum. And it’s nice to see the animals being so well looked after too. 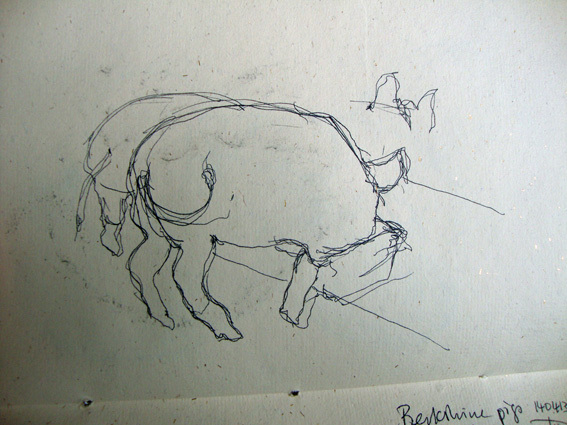 I love pigs – much more character than many animals, and great shapes for drawing. they’re lovely animals, very happy. Well, these ones are anyway because they’re kept well. I love the movement in the first sketch, very free and I like the progression as you added more detail to each sketch. Thank you, it sort of builds as you get more used to the subject. Sparta! Ming! The she-monkey is fraternising with other animals! Time to bring her a ‘present’ from the garden!